Fire Hydrant at the Southwest Corner of W. Warren Ave. and Evergreen Rd. I heard about this one, but I had to see it with my own eyes before I was ready to believe it truly. There is a fire hydrant at the southwest corner of W. Warren Avenue and Evergreen Road in the Warrendale neighborhood of Detroit that was repaired with duct tape. I don't know if this is an official repair that was done by someone within the City of Detroit. 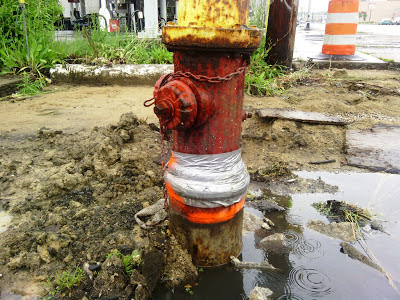 More than likely, one of the construction crews in the area damaged the thing while they were repairing the sidewalk and used duct tape to repair the fire hydrant. It's also possible, this is Detroit after all, that the thing was leaking for a couple of days and some random resident decided to repair it as best as he or she could. To repair a fire hydrant! I love this city, but I have to admit that Detroit can be dysfunctional in such comical ways sometimes. Update: July 11 @ 7:00 a.m. This story is now also covered on Deadline Detroit here. I've actually tried to fix my local fire hydrants before, by shaping a plug out of a wooden stick i found and hammering it into the missing plug, but it just filled up and started leaking out the front. The best method is a short piece of gardenhose or radiator hose, stuffed with a correct sized bolt at the other end and secured with a hose clamp, but i didnt have any of that on hand. I also tried plumber's putty but that was an even bigger fail. I shouldve used duct tape, lol. Duct tape. Always use duct tape. Featured Place to Live: 6235 Warwick St.